These quick easy recipes for sauces will make your dishes taste better than ever. Each recipe is for 1 cup of sauce. Blend all in blender until finely blended and chopped. Cover and chill. Good served with fish, roast beef or over tomatoes. Sauce is great with Greek Meatballs or Gyros. If watching calories, substitute with low fat yogurt. Just add a pinch or two of salt. In medium bowl blend cream cheese, tomato paste, lemon juice, salt and pepper, mix well. Stir in green onion, fold in whip cream. Cover and Chill. Good served over fish. Combine all ingredients stirring until well blended. Cover and Chill at least an hour before serving. Good served with meat, fish or salad. 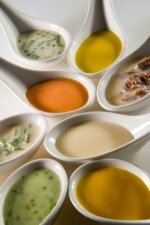 For variation and to customize to your dish, you can add to the sauces any of the following items. Capers, grated cucumber, chopped pickles, mushrooms, pimiento, green pepper or olives.